We give grantees money, but also something else. Every grant from Social Justice Fund NW was powered by the work of dozens of volunteer grantmakers and hundreds of individual donors. With each grant cycle we build relationships and deepen connections between change-making individuals and organizations. The resources provide and the relationships we build are an essential part of strengthening the social justice movement in the Northwest. What are distinctive features of SJF's grantmaking philosophy and practice? Applying for a grant from Social Justice Fund is different from applying to other foundations. Funding decisions are made through a democratic process by engaged, educated volunteer grantmakers in our Giving Projects. Funding is limited to community-based groups, led by those most directly affected by the issues that the organization addresses, which engage in community organizing around social justice issues. The majority of our grants are for general operating funds, which provide grantees with the greatest degree of flexibility and self-determination. Special consideration is given to groups committed to racial justice, especially those based in communities of color. This reflects an organizational commitment to combat racism by building political power in communities of color. Among organizations with primarily white constituencies, our grantmaking process prioritizes those that actively participate as white allies in racial justice struggles. We aim to distribute funds broadly throughout the region. While most funding criteria advantage urban organizations, we give special consideration to rural groups. This ensures the most even distribution of funds possible within our strategic priorities. Grants decisions are values based. We make grants to groups that share our values. We prioritize organizations whose primary work is organizing people on the downside of power to act collectively, because we believe that community organizing creates lasting systemic change from the bottom-up, thereby affecting not just the political and economic system but the culture of communities. We also believe that community organizing involves the most people, building grassroots power in numbers and allowing for the greatest diversity of perspectives to be expressed. We see community organizing as the exercise of democracy in action. We give the highest priority to organizations representing communities who have suffered from a historical pattern of oppression and discrimination resulting in impoverishment, vulnerability to abuse and economic exploitation, continuing social prejudice, and/or outright disenfranchisement. We prioritize these groups because addressing the extreme injustices they have faced demands the most broad-reaching reforms and social transformations with the most far-reaching political, economic, and social impacts. In addition to the philosophical considerations, our funding priorities reflect practical concerns. Community organizing is not generally supported by mainstream philanthropy. According to one study, only 1.5% of foundation funding goes to work that might generously be described as community organizing. Even progressive funders often avoid funding grassroots groups because they either lack the capacity to make and monitor many small grants, or they are unwilling to face the risks involved in funding smaller grassroots organizations. Social Justice Fund NW has 40 years of experience making grants throughout the Northwest. We fund both established organizations and emerging startups. Our grants span a wide variety of issues and invest in some of the most under resourced and innovative organizations making effective social change. Our members recognize that community organizing takes time and that the benefits of funding this strategy far outweigh the risks. How does SJF's grantmaking build a progressive vision of change? We believe that justice requires the elimination of discrimination based on race, ethnicity, gender, gender identity, sexual orientation, immigration status, economic status, religion, disability, age, or any other prejudice that tends to create or perpetuate imbalances of power. We are against militarism and colonialism, and stand opposed to business and government practices that exploit workers, undermine cultural diversity and freedom of expression, damage the environment, limit the self-determination of people and the sovereignty of nations, and restrict fair and equitable access to the resources necessary to live full and meaningful lives. We believe that basic needs such as health care, nutritious food, adequate shelter, meaningful education, full employment and equal employment opportunity, reproductive self-determination, and personal security are fundamental to living a full and meaningful life, and that the opportunity to live fully is a right rather than a privilege. The fair distribution of the resources necessary to insure these rights requires the full and equitable participation of everyone in democratic decision-making. Social Justice Fund NW provides grants to groups that share our vision and use culturally competent, bottom-up educational strategies for popularizing and expanding this vision as an integral part of their organizing practice. o If your organization is a nonprofit with 501(c)3 or 501(c)4 status as determined by the IRS, or be a federally recognized American Indian tribal government or agency OR is fiscally sponsored by 501(c)3 or 501(c)4 organizations or by federally recognized tribal governments, you can apply. o If your organization is not incorporated or fiscally sponsored, you can still apply, but you must speak with SJF program staff first. If you have not been funded by Social Justice Fund before, please fill out this pre-application questionnaire to help you determine whether you are eligible. All grantees must demonstrate that they are community-based and led by the people most directly affected by the issues the organization is working on. “Leadership” is defined by membership on the board of directors or its equivalent in terms of policy-setting, governance, and other meaningful decision-making for the organization. Community-based organizations empower those who have been left out of decision-making processes affecting their own lives, are democratically organized and responsive to their community’s needs, involve the affected community in shaping issue priorities and helping to sustain the organization, and develop and renew their own leadership from the community being organized. To see examples of the community organizing work Social Justice Fund NW supports, visit our past grantee page for profiles of successful grantees over the last few years. How many grant cycles does SJF offer a year? 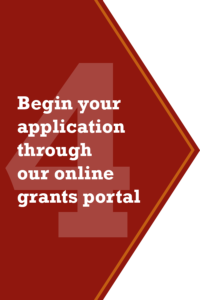 When do you announce your grant opportunities? We usually offer 5-6 grant cycles a year. 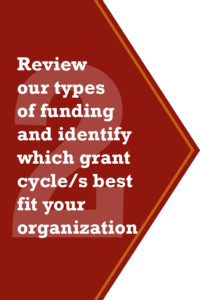 Each grant cycle focuses on a specific issue area or strategy. Though our grant cycles vary from year to year, we consistently offer grants focused on the following areas: Environmental Justice, Gender Justice, Criminal Justice, Economic Justice, Leadership Development, and Coalitions & Alliances. We generally announce our grant cycles in November, so please check back then if you are curious about next year’s grant cycles. Is there a limit on the number of grants I can apply for and/or amount of funding we can receive in a year? There is no limit. Organizations are welcome to apply to any and all grant cycles that they are eligible for. Is budget size part of your eligibility criteria? There is no minimum or maximum budget size to be eligible to apply for funding from SJF. However, we do give special consideration to groups that have less access to more mainstream sources of funding. Can I apply for a grant if my organization does not have 501(c)(3) status or fiscal sponsorship? If your organization does not have 501(c)(3) status or fiscal sponsorship, but meets our other eligibility criteria, you can still apply. There are limitations on how we can distribute funds to groups that are not 501(c)(3) and do not have fiscal sponsorship, so before submitting an application you must speak with an SJF staff person so we can help determine if your organization is a fit and explain what you need to know about how our process works for non-501(c)(3) groups. What other funders should we look at? Check out this list of other funders, many of whom prioritize social justice work in the Northwest. Who makes grant decisions at SJF? Applying for a grant from Social Justice Fund NW is different than applying to other foundations. Funding decisions are made through a democratic process by engaged, trained volunteer grantmakers in our Giving Projects, facilitated by SJF staff. Although our criteria and training are consistent across each Giving Project, every time you submit an application it will be read by a new audience. Even if you have spoken with an SJF staff person about your work or have a longstanding relationship with SJF, your proposal has to stand on its own and explain your work to an audience who may be unfamiliar with your organization. While SJF staff guide and facilitate the decision making process, our staff do not make decisions themselves. What are the reporting requirements of SJF’s grants? We ask for an annual year-end report that highlights the goals and activities you accomplished, your challenges, information about how you evaluate the effectiveness of your work, the number of people you engaged, and a place to attach photos. We typically do not require any financial reporting. Are SJF’s grants general operating funds or project specific funds? The majority of SJF’s grants are for general operating support, which provide grantees with the greatest degree of flexibility and self-determination. Our Rapid Response grants are project specific funds. Will you fund proposals that include lobbying? Most of our grants are general operating funds. For 501(c)3 organizations or organizations fiscally sponsored by a 501(c)3, no funds from SJF can be earmarked for lobbying or be used to participate or intervene in any political campaign on behalf of or in opposition to any candidate for public office, induce or encourage violations of law or public policy or take any other action inconsistent with qualification under Section 501(c)(3) of the Internal Revenue Code. This means is that for a 501(c)3, SJF grant funds cannot be used to directly lobby a legislative body or call on people to do a specific legislative action (i.e. “vote no on this upcoming initiative”). The laws surrounding 501(c)3 organizations and lobbying are complex and often misunderstood, so if you have any questions regarding what is acceptable activity for grant funds, please contact the SJF project manager in charge of your grant cycle for clarification. We also recommend the website Bolder Advocacy, which has excellent resources about what is and is not permitted by the IRS. We also fund organizations that have 501(c)4 status, fiscal sponsorship from a 501(c)4, or no status at all. If this describes your organization, please speak with SJF staff about your situation. We've never been funded by SJF before. 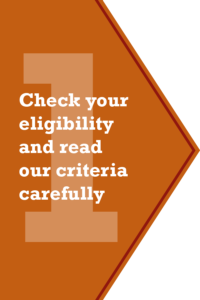 Are we eligible to apply for a grant? Yes, as long as your organization meets our criteria. About 20-30% of our funding annually goes to organizations that are first time recipients. How can I get more information and assistance in applying? 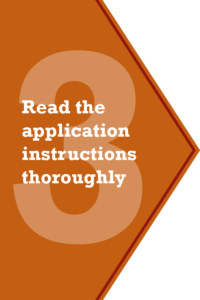 The first step for new applicants is to review the How To Apply section and review the eligibility criteria and guidelines. Then we strongly encourage you to get on the phone with us! We are happy to schedule a short phone call to talk with you and provide assistance and support with our grantmaking process. Keep in mind that as deadlines approach we may get a lot of requests and might not be able to talk to everyone, so reach out as early as possible to ensure that you’ll be able to schedule a conversation – even if you’re not yet completely sure about your application. Please review our different grant cycles to determine which staff person to contact. If you have trouble determining who to contact, send an email to grants@socialjusticefund.org. Use this searchable directory to see which organizations SJF has funded and in what regions. You can also find contact information for the organizations here.